One can imagine that one of the tasks of sub-editors at the Daily Express is to go through the copy and change all references to darkies to ethnics or non-whites instead, in the mistaken belief that that somehow makes the whole thing not racist. Perhaps it’s even an automated computerised process. 9 million living here are non-white, says government report. So what? It’s true, but … so what? Didn’t we have enough of the idea of racial purity after Germany, Yugoslavia, or Rwanda? Nothing good can come of this line of thinking. What matters is how people get on with each other and with the rest of society, something that this front page does nothing to contribute towards. The huge rise over just eight years means more than nine million people in England and Wales – equivalent to one in six of the population – are now from a “non-white” background. Why does it matter what colour they are? Plenty of people immigrate from elsewhere in the EU, but the Express doesn’t care about that. It’s the number of “non-white” faces that it focuses on. I don’t know how these statistics were measured, but it’s also worth pointing out that children from mixed couples will augment the number of people from a “non-white” background. 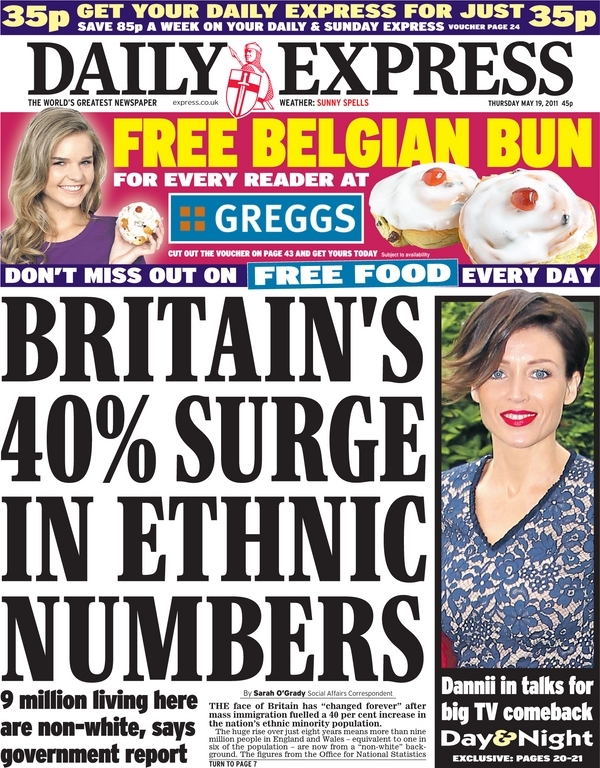 Unless you’re an armchair racial theorist obsessed with the dangers of miscegenation (the Daily Express’s target market? ), that’s actually a positive story about immigrants integrating into society. We know that Muslims are more likely to marry non-Muslims than Christians are to marry non-Christians, after all [link to follow]. At last, an argument that’s not obviously racist. However, it’s flawed. First, there’s nothing magic about the number 70 million. Second, more immigrants means more taxpayers—as you may recall, immigrants are a net contributor to society through their taxes. We’ll need to build more schools and maternity facilities, but we’ll have more money to pay for those things. In contrast, the number of white Britons has remained static over the same period. And here’s something that’s just not true: a table in the same paper shows that the number of “White Britons” fell from 45.72 to 45.68 million over the 2001-2009 period mentioned. Next time someone starts wringing their hands about how free online news is destroying newspapers and quality journalism, show them this and raise an eyebrow.